Like a lot of users, I had the problem with my Astro jumping out of the pointing dog mode. This caused me to miss getting the tone when my dog was on point. I kept watching the Garmin site for a software update to the unit. None were ever shown. I called Garmin today to see if a fix was in the works (secretly hoping the fix would be to upgrade me to a new DC 30 collar). The rep informed me that even though a software update was not listed, there was one available. If you run the WEBUPDATER program, the update will be automatically detected. The update is to version 2.40. Here is what the fixes are. ·	Correctly displays Dog Info page if all of dog tracking is paused. ·	Prevents proximity tone setup from blocking key tones. ·	Improves accuracy of altimeter total ascent/decent calculation. ·	Improves reliability of altimeter data reporting. ·	Added ability for Mac to communicate with DC 20 via the Astro 220. ·	Improved reliability of DC 20 communication status indicators. I had to run the WebUpdater twice. Once with just the handheld unit (Astro 220) powered on and once with the handheld and collar unit (DC 20) powered on. To update the DC20 unit, you must do the following. 1. Hook up the hand held to the PC using the supplied USB cable. 2. Power on both the hand held unit and the collar unit. 3. Push the "dog" button to bring up the dog tracker screen. 4. Using the arrows highlight the Dog associated with the collar unit you want to update. Press the "enter" button. 5. When at the screen for that specific dog, Press the "menu" button. 6. Arrow down to the "Upgrade Dog Unit" selection. Press enter. 7. When the "ready to communicate with PC" screen appears, run you Webupdater. 8. ON the second page of the Webupdater wizard, Verify that the DC-20 Device is the device to be upgraded. 9. Continue on with the webUpdater wizard. 10. Repeat with any addtional collars. Thanks, AZ. I contemplated calling them but just didn't feel like going thru the long hold times I have experienced in the past. You were very kind to post instructions as well. 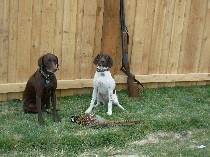 Good training till fall, good hunting after that. That's a good find, and thanks for the "heads up". I'll wait for the dc-30 to get here to do it.. Maybe then I won't need an update? ?